* You have to give credit to Gombe United FC for their ability to discover promising youngsters and turn them into quality players. Sani Mohammed, also known as Sani Mohammed Sulaiman, is a left-winger or striker who has been sensational since joining the “Desert Scorpions” from the Yarmalight Football Academy, also based in Gombe, northeastern Nigeria. Apparently, Mohammed was 15 years old per July 2013, implying that he is born in 1997 or 1998. Mohammed, a skilful player with tremendous pace, has featured in the last nine league matches for Gombe United FC, scoring his first ever league goal on 08.06.2013 against Wikki Tourists FC. Aliyu Bilyaminu is another interesting youngster at Gombe United FC, also a former player of the Yarmalight Football Academy. Bilyaminu, also known as Ali Bilyaminu, is a midfielder / striker. * Ibrahim Babangida has scored four league goals for Gombe United FC during the last five matches. Babangida featured for Bayelsa United FC during the first part of the season. Last season, Babangida won promotion with Nasarawa United FC, scoring three league goals. Babangida played for Kaduna United FC during the Nigeria Premier League 2009-2010, scoring two league goals. Babangida, who is also known as “Shuaibu Babangida”, is a striker / winger and has been described as a fans’ favourite at Gombe United FC. * Goalkeeper Segun Ayo, formerly of Niger Tornadoes FC (2012) and Plateau United FC (2010-2011) has joined Wikki Tourists FC. Ayo has started the last two matches, producing match-winning saves on 04.08.2013 against Bayelsa United FC. * Midfielder Abdulkarim Lukman (born 06.09.1990) played four matches for the Nigeria U-17 national football team that won the 2007 FIFA U-17 World Cup in Korea. After the tournament, Lukman joined Israeli side Hakoah Amidar Ramat-Gan, withouth a great deal of success. Lukman is currently playing for Wikki Tourists FC, alongside defender Mustapha Ibrahim (born 13.12.1990), his teammate from the Nigeria U-17 team. * In June 2012, the so-called Football Academy Abuja participated in a friendly tournament in Croatia. Stephen Abandy was one of the players that impressed Croatian journalists, being described as a “22-year old”powerful striker”. Abandy has recently joined ABS FC in the GLO Premier League. * ABS FC has also signed goalkeeper Abdullahi Boje and striker Muktari Salihu. Boje played for second-level side Ila Orangun FC during the Nigeria National League 2012. Salihu started the season at Wikki Tourists FC. Last season, Salihu scored one league goal for Wikki Tourists FC. * Striker Obinna Eleje has left Enyimba FC and joined Nasarawa United FC, apparently on a loan-deal. 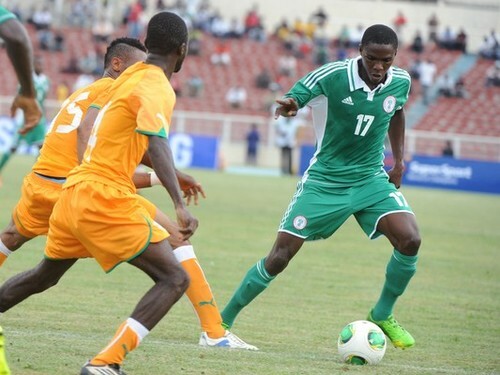 Eleje scored one goal for Enyimba FC during the Nigeria Premier League 2012, the club he joined from FC Abuja. There are several interesting players in the squad of Akwa United FC. From my point of view, a couple of players stand out. * Top-scorer Mfon Udoh has scored eight goals during approximately 20 matches. Udoh has been described as a “skillful striker” with “goal-poaching instincts”. Last season, Udoh was a fringe player at the club, scoring no goals. * In June 2013, winger / striker Ezekiel Mba was picked for the Nigeria B national football team, a bit of a surprise from my point of view. Nevertheless, Mba was highly impressive during the CHAN qualifiers against the Ivory Coast B national football team, tormenting the Ivorian defence with his sublime speed and dribbling skills. Mba, who scored two goals for Niger Tornadoes FC during the Nigeria Premier League 2012, has yet to score for Akwa United FC. The picture is of Mba and was found on searchtopics.belfasttelegraph.co.uk. * Centre-back Hamza Ikenna Onwuemenyi is apparently on the wish-list of bigger clubs, including Rangers International FC. * Enterprising winger / striker Ubong Ekpai is apparently on the radar of South African clubs based on his tremendous start to the season.